Lubetkin seems to have seen this building as an opportunity to creatively explore the possibilities of a new building material available in 1934 - reinforced concrete. 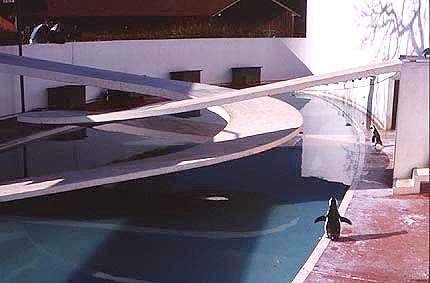 Having studied the habits of penguins he created a penguin enclosure and pool that provides an interesting environment for the penguins, a multiplicity of viewing angles for the spectator and a Modernist building of true clarity and style. After setting up the architectural group 'Tecton' in 1932 the penguin pool was one of his first commissions, from the Director of London Zoo. The overall elliptical shape is referenced in the spiraling intertwined ramps that connect the different levels; these sloping cambered ramps give a dynamic feel to the building. The large elliptical blue pool provides the birds with a large swimming area and also gives a contrast to the white concrete used throughout. 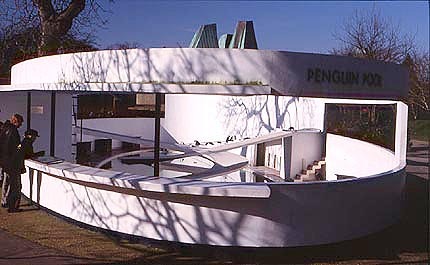 There is a partially shaded area to provide the birds with protection from the direct sun, and the gently curved walls are designed to echo the penguin's cries. This building cleverly combines practical considerations, such as a shaded area for the penguins and gently sloping access to the pool, with a powerful aesthetic statement of form and line. The penguin pool is a Grade 1 listed building in the UK Government scheme for protecting important buildings. London Zoo is open every day except Christmas Day. The nearest underground station is Camden Town. For more information call +44 20 7722 3333, or the London Zoo web site has comprehensive visitor information at www.londonzoo.co.uk. All links outside galinsky will open in a new window. Close it when you've finished, or use the Window menu on your browser, to return to galinsky. copyright © galinsky 1998-2006. e-mail info@galinsky.com.